A comprehensive archive is available covering about 7,000 books from the USA, England, France, Poland, the Soviet Union, Czechoslovakia, Holland, Japan and Greece, to name but a few. Special emphasis is given to illustrated books, but only once the sources of the photos and the publishing criteria have been established. Moreover, there are hundreds of original magazines such as the complete edition of the “London Illustrated News”, the “Signal” in French, the Italian “Tempo” and even articles by the NS (Nazi) press. 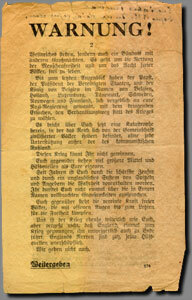 The archive also contains more than 12,000 post-war articles about all aspects of the Second World War. In addition to original documents collected over a period of 40 years there are some 70,000 copies of NS documents from Polish, German and British archives. Besides text documents there is a small film archive showing interviews with prominent people of the time such as Sir Frank Roberts, Chief of the Central Department at the British Foreign Office and advisor to Winston Churchill for Eastern Europe, Countess Klementyna Mankowska, who was a top spy for the Allies, and Dr. Günther Nollau who was a member of the counter-intelligence unit and later became President of the Federal Office for the Protection of the Constitution. The film archive is complemented by a comprehensive video archive containing some 1,000 or so cassettes with over 4,000 items relating to Word War II, the Third Reich and the post-war era. All materials are currently being labelled and archived. The collection of photos is continuously growing. It is presently also being archived and is made up of about 6,000 historical pictures of the period 1933 – 1945 and more than 25,000 photos of historical places which were taken at all European WW II sites. There are black-and-white and colour photographs as well as 6x6 slides or smaller. A large number of these pictures, which have not been published before, are original photos taken of Adolf Hitler between 1938 and 1943 as well as of aerial warfare. They represent the biggest photo collection of air-raid shelters and facilities, fire engines, and weaponry systems. Moreover, there are photos of subterranean sites and bunkers for V-weapons, military training areas, barracks und museums. In addition, comprehensive documentation is available on Normandy, the production and launch sites for V1 and V2 rockets, the guerrilla war in Poland and memorials in Germany, in which the focus has generally been on historic colour photos. Aerial photos, ordnance survey maps and other maps have been taken over from the archives of the well-known military historian Janusz Piekalkiewicz. All materials are presently being digitalised, so that reproducible CDs and DVDs can be burned on request. (Please refer to Bookings). 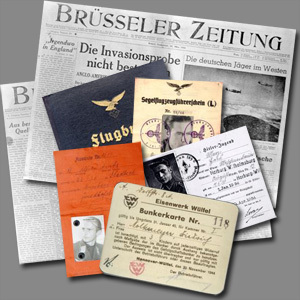 There is huge collection of recorded statements by contemporary witnesses, especially members of the Gestapo, the SD (security service), counter-intelligence, the SS, the air force, and civilians. The archive contains transcribed recordings, hundreds of original letters and diaries with an emphasis on aerial warfare and the war in Poland.